You are here: Home / Collaboration And Convergence / Order-Taker or Innovator? Are you an order-taker or an innovator? You are in sales or engineering, or a sales engineer. Chances are you feel your role is that of a problem-solver. The key to differentiating yourself as an innovator is in your attention span when problem-solving. Order-takers are asked “Can you make this?” by prospects and customers. Innovators are asked: “What do you think about this?” How would you like to be regarded by your customers? 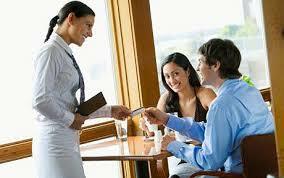 If you are an order-taker, you are perceived as a commodity, like a waiter in a restaurant. You provide the menu, take the order, return with food, collect the money and move customers through your station as quickly as possible. Table churn means a paycheck to you. If you are an innovator, you’ve developed a loyal customer base who demands to be seated in your serving area. You are part of their dining experience. You get to know them. You make suggestions for customizing menu offerings. You are attentive to their preferences. You don’t rush them through the selection process. You aren’t concerned with table churn. You understand that your income and profitability are based on a loyal and retained customer base. You are focused on developing a long term relationship with those customers. This analogy holds true for business development and sales outside the restaurant industry. The innovator listens long enough to determine the full context of the customer’s problem. One waiter is doing their job. The other is creating an experience. Root causes can have tremendous contexts. Your listening span is the difference between solving a discrete problem (order-taker) so you can meet your sales quota or number of monthly billable hours OR realizing how that one discrete problem is tied to multiple opportunities for repeat business (innovator). The order-taker mistakes an appointment/conference call as interest to purchase. The order-taker assumes 100% of customers will order. Every customer has the option of walking out of that restaurant. How frequently are your VARs sending your sales engineers out to demo on another “hot” prospect? That’s a great way to showcase your expertise; how much control do you have over the sale vs. your VARs? Appointments are difficult enough to secure; are you wasting your time showing up and throwing up to prospects with no authority to purchase but plenty of time on their hands? Engineers love to problem solve with peers on unapproved, unfunded projects. Are you giving away pro bono expertise which becomes the basis of design for an RFQ awarded to the incumbent? Review last month’s appointments. Were you an order-taker or an innovator? Use your insights to be more mindful of the total experience you create for customer engagement throughout that customer’s lifecycle. Become more discerning about how you want to be regarded by your customers. Waste less time order-taking. You’ll soon be on the road to innovating.